The Jefferson Public Parkway Highway Authority (JPPHA) is accepting applications from residents to serve on the Local Working Group for the Jefferson Parkway project, as it moves through design and towards implementation. The Group will provide feedback and share project information, acting as a conduit between the community and project team. Read more and apply at the JPPHA website. The Jefferson Parkway has been part of the City's long-term vision since the community and elected officials first recognized its potential benefits decades ago. In 2008, Arvada joined the City of Broomfield and Jefferson County in forming the Jefferson Parkway Public Highway Authority (JPPHA) with the goal to construct the last unbuilt portion of the metro beltway. Complete a road system that will directly connect Arvada to the entire metro area--north, south, east and west. Reduce traffic congestion and, therefore, travel time and associated travel costs. Potentially increase traffic safety with fewer collisions. Create alternative transit opportunities with the inclusion of bike/pedestrian trails from end to end. 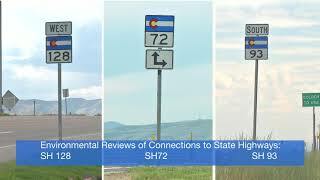 Increase accessibility for future development, which will allow significant financial benefits to Arvada with recent studies projecting those fiscal benefits to be 17 percent higher over the next 20 years with the completion of the parkway versus without it. Furthermore, the City of Arvada, through an intergovernmental agreement, will be reimbursed for its contributions to the project. For additional information regarding the parkway and JPPHA, visit jppha.org. Download the PDF to view the Jefferson Parkway milestones beginning in 1968 to the present. To view project map in a larger version, download the PDF. Click on the preview below to watch. Get more videos in our video gallery or on YouTube. Jasny is an extension for Twitter Bootstrap. This site uses it for making tables and other componenets more interactive. For more information, please see Jasny.GitHub.IO. Bootstrap Accessibility by PayPal allows us to make this site more accessible for screen readers. To find out more, please visit PayPal.GitHub.IO. This script is intended to help make scrolling smooth. It is not necessary for browsing the site. A responsive menu is enabled with this script. It is not necessary for browsing the site. DataTables is a rich plugin for jQuery that makes it easy to enhance the display and use of tables. This site uses DataTables to make the Department Directory easily searchable and sortable. For more information, please see DataTables.net. This script is a plugin for DataTables. jCloud is used to make "tags" on pages more aesthetically pleasing. For more information on jCloud, Copyright 2011 by Luca Ongaro, please visit GitHub.com. This script is used to make drop-down menus more aesthetically pleasing. For more information, please see https://developer.snapappointments.com/bootstrap-select/. Lighter, copyright 2010-2015 by Kevin Sylvestre, is a lightweight tool that allows this site to present images in a modal or "pop-up" fashion. To see this script, visit http://ksylvest.github.io/jquery-lighter/. All business applications have special functionality. This script helps the applications to be easier to use. The City of Arvada uses Piwik to gather analytics on website use. No personal information is collected during this process.